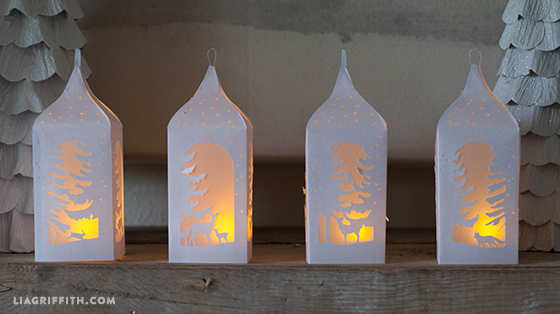 Today we are kicking off our full line-up of winter holiday projects with these fun winter paper lanterns. Our Halloween lanterns were such hit that we knew we would be sharing a winter version with you as well. I love how these pretty woodland paper lanterns look on my mantel and will often light them in the early evening to enjoy through dinner. We made these lanterns with our favorite crafting tool, the Cricut Explore. If you have a personal cutting machine, you can download the SVG files below or if you would like to cut these with a craft knife you can download the printable template below. These lanterns were made with a metallic white paper from paper-papers.com and we inserted sheer windows to let the light through using frosted vellum paper from Michaels. Become a member to download the pattern below. Print and cut, then score and fold the sides to form the lantern shape. Secure together with glue dots, double sided tape or hot glue. Add a loop of ribbon to the top as you glue the four points together for a gorgeous finished look. Hi Lia, I love the Winter Lantern but I can’t figure out what the optional base is for and it would attach to the lantern. Hi Paula– the base is just in case you want your lantern to be closed at the bottom. You’d fold it up and slip it in the bottom. Thank you so much for all your lovely ideas – I’ve downloaded so many things that I hope to do when our house-move is finally completed. At the moment, all my craft “stuff” is stowed away in boxes and I’m itching to get my hands on something to make. Mind you, I’m not sure I’ll ever get through all of the beautiful designs you have created! The reason for this message is to ask about the crepe paper Christmas trees that are in the background of your beautiful Winter Paper Lanterns pictures – are instructions available for these? I’ve already saved instructions for the ones that look like separate “leaves” (in the hope that I’ll be in my new craft room by December!) but these look a little different. 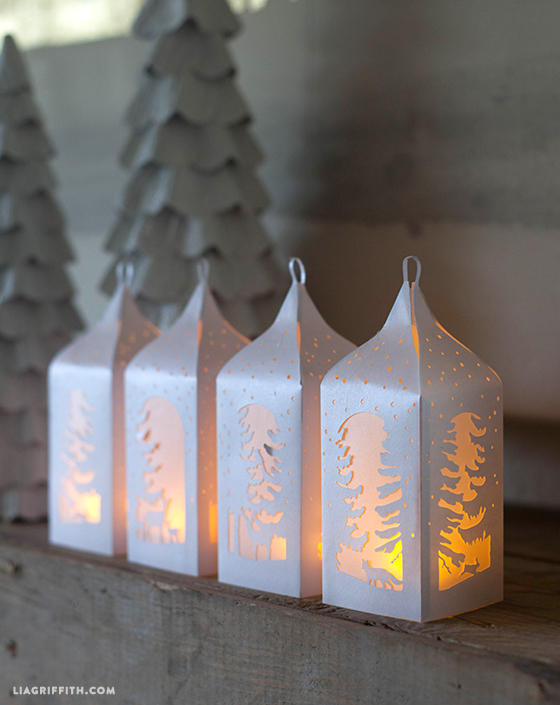 I’d love to have a little Christmas forest on my window sill to impress our new neighbours! We’re so happy that you’re enjoying all of the projects we have! We feel your pain when it comes to re-organizing your craft room. Make sure you take a look at our new craft room tour when you’re ready to settle into your own space, it’s full of great organizational ideas! We don’t currently have a pattern up for those particular crepe trees, believe it or not this post is from 2014! 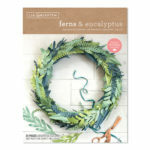 But we do have a couple of other options for crepe paper trees, we’ve included some of those links below. Hope this helps! 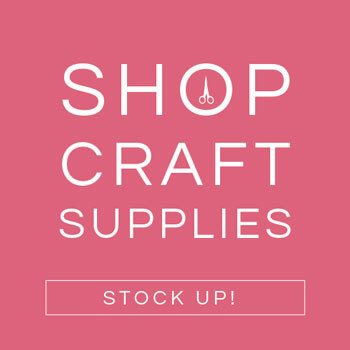 We’re so excited you’re going to be crafting again! Please let us know if you have any further questions and we would be happy to help. What size are the dimension of the lantern? Hello, can you tell me what thickness of paper you use for these and also the elegant paper cut holiday cards? thank you! Hi Louisa! We prefer to use the text-weight paper for both of these projects! Hope this helps! Is the winter lantern no longer free? I wanted to test it out before becoming a member. Please let me know. Thanks. These are so cute, and I’m really wanting to make them to send out in Christmas cards. I’m using a Cricut Explore and trying to upload the SVG file to the Cricut Design Space but I canNOT get it to cooperate unfortunately. I’ve downloaded and unzipped the files multiples times. I can access the PDF perfectly well. But when I try to open the SVG in Design Space, it says that it is an ART5 file and so can’t be opened. Any troubleshooting tips? Ok, I’m not sure what happened, but after unzipping it a few more times to a few more places in a few different ways (gah, how did there get to be so many ways to unzip files?!) I was finally able to get them uploaded! Fingers crossed that these mechanical mysteries stay cooperative. Looking forward to making these awesome lanterns, thanks! Oh I’m so glad you figured it out! Thanks for letting me know. Hello – We purchased two products today and discovered there were no instructions how to assemble. 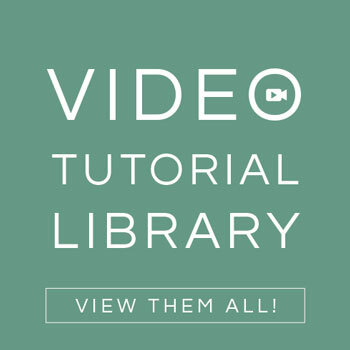 Is it possible to forward step-by-step so that we can actually utilize them? Hi Pam! 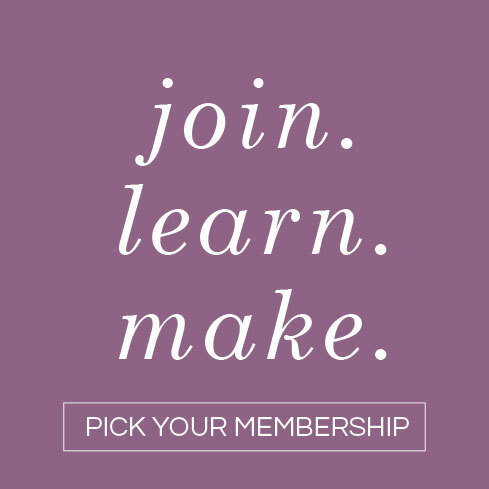 Yes, you can become a member by signing up here: https://liagriffith.com/membership/ Members have access to hundreds of downloads, patterns and templates! I used my Brother ScanNCut to make these amazing lanterns. I had to delete the fold lines, as I can’t do the scoring by machine, but it was no problem scoring the fold lines by hand. I made 20 lanterns as table decorations for my volunteer appreciation celebration this evening. They were a big hit and were given in a draw at each table. I used Christmas scrapbooking paper and then added some holly leaves and berries to the top. I was really proud of the results. Thanks so much for the amazing design. Oh my. Made this tonight and think it is the most darling thing ever! I didn’t know how to make the base so I folded the tabs in and overlapped them, then fitted them into the bottom of the lantern by pressing and fiddling. Hope that’s right. I take it you pull the base out to turn the votive on and off–is that correct? I am super confused how the bottom part is supposed to go on, or be folded for that matter. I just ended up with this weird box, with a hole in it. Hi 🙂 ! Your idea is beautiful! I have a question, could I use this pattern to do a project for school? Making these for my daughter wedding and now have a coyote Pettite who would like to pay me to make them for their event. Can I do this if I properly credit you with the design,? I have a cricut expression 2. Is there a way to upload these files to the cricut craft room? The lantern is gorgeous. I love it. I would like to use it on my mantle this Christmas. I am using MTC to cut the project. I have a problem with the fold lines. They are cutting instead of coming out as dashed lines. Any idea how to change this? Hi! 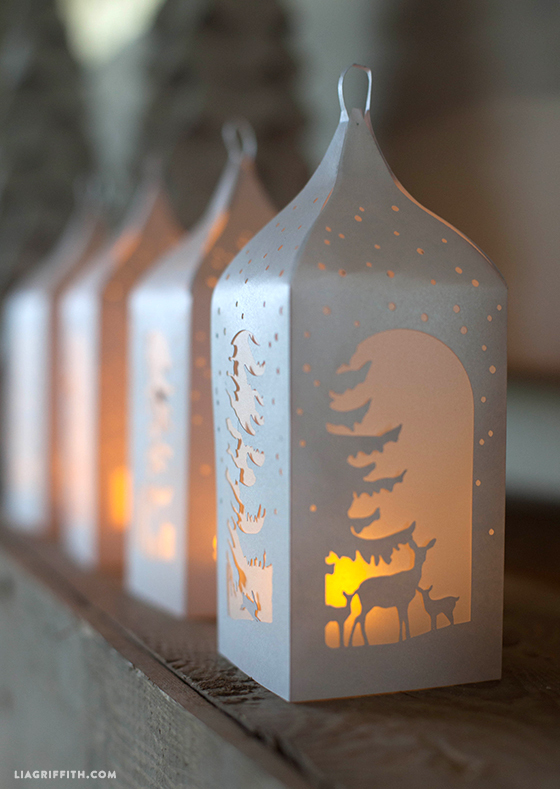 I love these lanterns and got the cut-out-file printed, have my craft knife ready but don’t know how to assemble the lantern. What is that extra piece on the second page and where does it go? Sorry for bothering you. i am confused how the base assembles…. In the PDF, the dashed lines are cut lines and in the SVG file the green lines are the cut lines. Once you do your cutting you fold the top box (the long skinny one) over the whole piece and then the flaps fold together like a box. I hope this helps! Loved these lanterns so much I went out and both the Cricut. I have never used in my life and I don’t craft. Would you kindly let me know the exact size of paper and vellum to buy to achieve what you made? I am so glad that you have felt so inspired by this project, this is exactly why we do what we do!! The paper is 8 1/2 x 11 metallic paper by Paper Papers and the vellum we got from Michaels. Happy crafting! Very nice file! Cuts like a jewel! I just have one question – how big did you cut your vellum to make the frosted windows? Thanks so much for sharing this file and I look forward to making many more of your amazing creations! It depends on the size you cut the lanterns, we just used enough vellum to cover the windows. Happy crafting! This is one of our favorite projects. I uploaded to my explore which I’m still learning, ( lanterns) but there are no instructions am I supposed to use two cuts? Like it shows ago two cuts on same paper, I thought it was a scorer but was not, pls help love the lanterns. The black is the paper that is being cut, the pink lines are indeed the score lines. Select just the pink line layer and click on the scissor icon and change that to score. Then select both layers select attach and go to cut. For the base of the lanterns are all the lines cut lines or are some score lines? I’m confused how this folds to make a base. These files are super thank you for sharing…!! No, I don’t sell any finished projects. Yet…. You can use the SVG file for your Silhouette. You will need their upgraded designer software though. Once that is installed you can import the SVG and you should be good to go! Hi Lia. These are beautiful. Will I be able to cut out these files with my Brother ScanNcut? This is such a cute idea and I am attempting to do it after upgrading to the Design Edition on the Silhouette Cameo. What settings do you put it on when you do it? All three that I have attempted to do keep tearing in places where fine detail is. I have tried a new cutting mat and I believe a new blade and slowed down the speed. Any help appreciated. Thank you! Oh no, I am sorry to hear that. We find that the Cricut Explore is better at cutting fine details so we don’t use our Silhouette anymore, so I don’t know what setting to use. Have you tried contacting their Customer service team? Thank you sooooooo much! These are just gorgeous! Your talent is really amazing! Happy New Year! Firstly thanks Lia for sharing your beautiful designs, you’re such an inspiration! I have also been having trouble importing them into my silhouette V3 however I think I have found the answer and thought I’d share it with you for anyone else having the same trouble. Que c’est joli ! Merci pour ce partage d’idées et de réalisations. Le plaisir de découper puis d’illuminer avec de petites bougies led , reste une poésie tendre associée à Noêl, pour les petits …et les grands ! Merci… Joyeuses fêtes !!! So pretty! I love luminaries and lanterns, thank you so much for sharing! Happy HollyDays! Hi! Thanks for the great lantern templates! I just mixed the Halloween and winter one together and it looks great! I have the lovely top from the halloween lantern but skipped the halloween-y things and added the reindeer, fox and rabbit to it, just lovely! This looks so graceful for parties! I’ll be trying this for new year’s eve dinner. Hello, my name is Adrian and I am from Romania. I follow your site for a long time and I realized some of your projects. Thanks for share your ideas with us. Happy Holidays! So great to hear from you! Happy Holidays to you too. Thank you! The lanterns is wonderful! Thank you for sharing these beautiful designs. Sadly, Silhouette Cameo Designer Edition will not open any of your SVG files. I am so sorry to hear that. Maybe the Silhouette customer service team can help you trouble shoot, my files should work but I don’t have a Silhouette to test myself. Thank you very much! The lanterns are wonderful! You are welcome! Hugs from across the Atlantic! These are gorgeous! Unfortunately, even though I have Designer Edition for my Silhouette Cameo, a corrupt file message appears, and it will open this file. Have you tried contacting Silhouette’s customer service team and ask if they can help you. I am no longer an expert on the Silhouette. thank for sharing this Lia ! they are gorgeous! but can i ask you one small question? i’m wondering how can u make it light up like that? i have never done this before and i really wanna try at once! please give me some small tips if you are pleased to 🙂 thank you again! I use battery driven tea lights (fire proof) I got mine at Michaels but I have also seen them at IKEA. Hi Lia.. I’m having the same issue as Marijean. File won’t open in my Silhouette program. I do have the designer addition. Sorry, I am at a loss. Have to tried contacting the Silhouette Customer Service team? Congrats for this beautiful DIY!!!! I’ve found it with Pinterest and you can be sure I will try this!!! Thanks a lot! So happy you found me! Hugs! Okay I am missing something. I found your site through Mark Lipinski’s blog. I love your work, however I can not get any of your downloads to work. When unzipped, the svg files are not recognized by my software and if you click on them they launch an IE window that will not open. All I get is an error message from IE. Is there another way to get these files? Hi Candace. The SVG files are only for personal cutting machines and can only be imported into the machine software. Sorry for the confusion. I always include a PDF file for those without a cutting machine so everyone can use the projects. Wow Lia, they look just amazing. Have downloaded the template and can’t wait to have a try at cutting it out tomorrow. Thank you soooo much for putting it up. But my is you site addictive….Have spent soooo much time looking through it and watching tutorials, but it is all fascinating – you are so talented. Was only introduced to the world of paper flowers last week and I am hooked. Appreciate all the work you have done in sharing your time and skills. Have a most wonderful Christmas. Paper flowers are addictive! But it is a good one to have. 😉 So happy you are here. GGAAHHH..I cannot figure out the bottom piece. Can someone explain, or link me to a similar item that shows how it is installed? We did not use the bottom for our lanterns since they are sitting on the mantel. You can use them if you are wanting to hang. Just fold the tabs up and glue tabs inside of the lanterns. Again, they are just an option but not a must. I am having a hard time figuring out how to put the lantern together. I cut out the main piece and then there was another cut that just cuts in various places on it and I’m not sure how it goes together. Could you please help? It might be something easy that I just don’t see. Thanks! Hi Pamela, there should be one piece. The shape of the lantern, the other lines should be scored. Without seeing it it sounds like you will to change the setting on your Cricut from cut to scoring. Hope that works! Maravillosas! Un saludo grande desde Argentina y gracias por compartir! Hello to you too! And you are so welcome! Merci beaucoup pour cette jolie lanterne ! Another WOW and thank you for sharing this file. Love it. Happy you like it Mary! I worked it out, I was trying to interlock the pieces! Have to laugh at myself 🙂 In the meantime, I altered the bottom so that the lantern can be hung with the votive inside. I took the insert from my cupcake box and adjusted the template so that it fits snugly into the lantern base with the votive fitting snugly in the top centre. The base isn’t glued in so it can be pulled out to change the battery and to switch the candle on and off. It looks great! These are beautiful! Thanks for sharing your files so generously. I cut one last night, but I cannot work out how the top of the lantern is folded/glued! Is there a tutorial somewhere? I didn’t do a tutorial for this, but if you use the tabs to attach it to the side of the next you can make the shape work. Thanks a lot for your free pattern. Might be a lovely thought that your lanterns will light up a christmasbrunch for 150 lonely eldery people in the netherlands! I love it. Thank you!!!! Thanks Lia. I made these with glitter paper. Very pleased. Also made the snowflake one. Please share pictures with us at hello@liagriffith.com Love to see what you create! sorry I saw mention of the bottom but how do you add/attach it? This might sound a bit crazy:) but after adding the bottom I realized you cannot get to the on/off switch on the candle so I would recommend skipping the bottom. merci beaucoup pour cette belle lanterne. Thank you so much for sharing! I absolutely loved the Halloween lanterns and I can’t wait to make these! I honestly decided to pass on the bottom, it was an afterthought but I realized that it is harder to get to on/off switch on the candle if there is a bottom on the lantern. Lovely lanterns! Thank you for sharing. What did you size them as on the CDS? I print them on 8 1/2 x 11″ so try 10 1/2″. Have fun!! Merci beaucoup c’est trop beau on retrouve l’esprit de Noël. Thank you very much it’s so beautiful we find Chrismas spirit! Sorry for my very bad english! These are really beautifull!!! I want to know the size of the ones in the picture. I printed the PDF version and are quite small!!! Your ideas are really wonderful!!! I printed them on 8 1/2 x 11″. You can re-size in your printing option. Enjoy! Thank you so much! The lanterns are beautiful. I am going to try my hands at making a few. Lia your site rocks. So pretty, thank you Lia! Simply gorgeous. I keep thinking “she can’t possibly outdo this one!” And then you do!! You just put a huge smile on my face, thank you!! I can’t open these in my Silhouette. I try and it says the file might be corrupt. Any ideas why I have this issue ? I would love to make these. They are gorgeous. You have to have the updated Design Edition software to upload SVGs onto Silhouette? If you have that I am not sure why it is not working. So, if there is no bottom to these what is the second sheet with the scallop edge for? I’ve been waiting for these since you teased them on FB a while back. Cut one last night, and it is gorgeous! Thank you. Thanks for your patience:) The Halloween lanterns were so popular I had to make one for the cold and dark winter months. Enjoy! Absolutely divine. I can’t wait to cut them. Thank you so much. You are so very talented. These are so beautiful! I want to make them but they come into my software in a strange size. Can you tell me please what widths the pieces should be? Thanks so much. Love all your stuff! I cut on 81/2×11 so I would say 10 1/2″. Lovely! Thank you very much. I also loved the Halloween one! Thank you so very much, they are so pretty. GOD bless. Lia Thank You So Very Much. I have been praying you would share with us your beautiful Lanterns. Thank You from the bottom of my heart.. You are a Gem. Such wonderful talent! Thank you for sharing. Love your site. The lanterns are gorgeous. I don’t have a cricut nor will I be getting one can’t afford one but I love seeing the gorgeous creations. Thank you for sharing. If you are brave and have a lot of patience you can cut by hand using an exacto knife, that was what I did not long ago and several of my readers do using the PDF file. Love these. Thank you so much for sharing. Just lovely, Lia!! I am planning to get a Cricut Explore and make all new holiday decorations for my tree after scouring your blog for great design ideas. You totally have me INSPIRED! Enjoy! You are going to love your new Cricut Explore, please share pictures of your work with us at hello@liagriffith.com Love to see what my readers make! So happy you like it:-) Love the warm glow, it is getting dark so early now. Hi Lia, The lantern cut out beautifully, but I would need the pdf instructions on how to place the bottom on. Thank you so much for sharing. That is easy, there is no bottom just 4 sides coming together at the top! Enjoy! 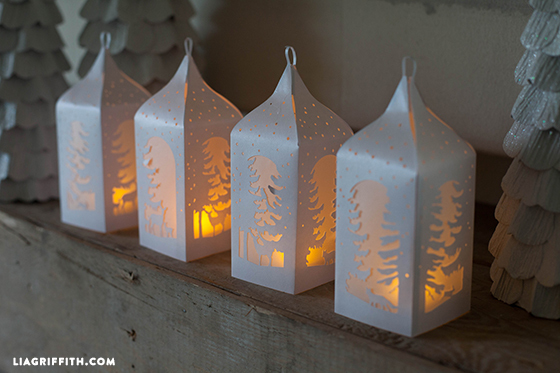 These winter lanterns are beautiful! Thank you for sharing. Gorgeous lanterns! Thank you so much for sharing, Lia! Have the Cricut Explore, haven’t really used it. Loved the Winter lanterns. So scan the lantern patterns and have the Explore cut it out?? Yes, use the svg file! Beautiful! What size paper did you use? 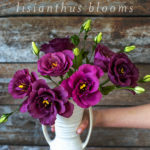 These are beautiful, can’t wait to make one! Another fabulous idea! Can’t wait to make them for Christmas, so I am going to make them in green and brown for Thanksgiving or maybe a dark red? Won’t be as knockout good looking as they are in silver, but I miss having my Halloween Lanterns around! Thank you! SO excited to use these for my wedding! Thank you Lia! How much longer until your cartridge comes out? 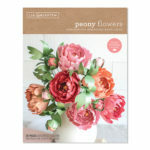 I’m so excited to try my hand at these and the paper bouquet. You are sweet! Thank you!